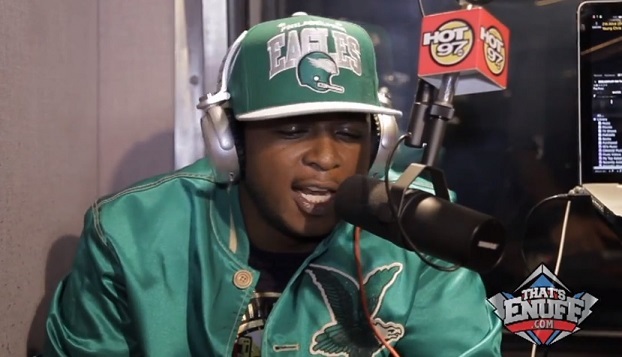 Young Chris paid DJ Enuff a visit over at HOT 97 for the latest episode of his Hot Box series. The Philly native opens things up by explaining to viewers that his new Vital Signs EP will serve as a prelude to his forthcoming Alive LP. Chris also weighs in on the importance for him to cater to his core audience which he credits for holding him down no matter what. The rapper addressed the current Hip Hop scene in Philadelphia and reflected on his early days with Roc-A-Fella. Before heading out, Young Chris hopped on the microphone and delivered a lyrical tirade over a couple of instrumentals courtesy of DJ Enuff who was on the turntables. This entry was posted in In The Studio, Interview, Video and tagged Dj Enuff, freestyle, hot 97, Interview, philly, radio, Vital Signs, young chris, young gunz. Bookmark the permalink.